The lead - Administration Building | Kedo Zrt. The building’s primary function is to hold offices for administrative staff assisting educational activities. Measuring just over 3,000 square metres, the new structure will be the smallest one by area at the Campus. Boasting a rooftop terrace, in the building will be the Chancellor’s Office, the Rector’s Cabinet, the Education Office, the Student Services Centre, the Dual Education Office as well as offices of the Payroll, HR, Accounting and Finance functions. After being done with all administrative tasks, students may enjoy a bite at the terrace cafeteria on the ground floor. The building is directly adjacent to Izsáki Street, and is easily accessible both by bus and on foot. 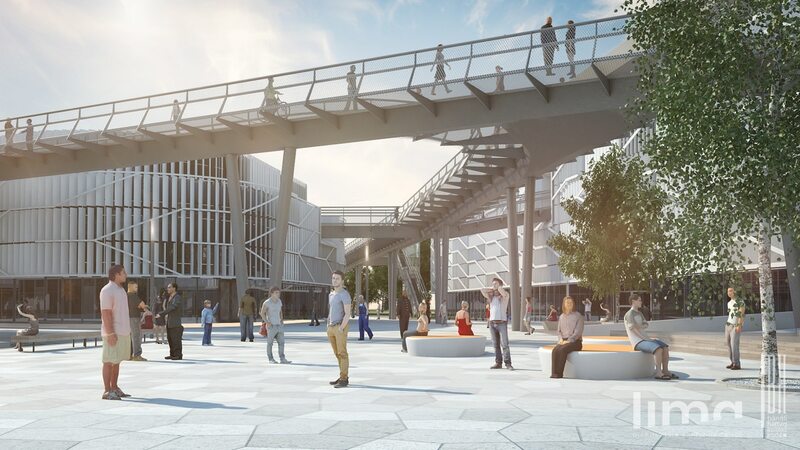 Besides through the Administration Building, the planned rooftop terrace is also accessible from the higher floors of the neighbouring Educational Building through a skyway. The Campus will be built using smart and green solutions to make the time spent at work a unique experience. Though we hope staff members and students will find pleasure in the aesthetic and technological features of the buildings, we are eager to assess the needs of future employees and students and incorporate them into the planning process. In addition to designing an accessible building, we would like to support a broad range of options when it comes to commuting to work. You can leave your car in the parking garage that also has a guarded bike storage facility for cyclists.